Part of the show Outnumbered: Are your bacteria controlling you? Danielle finds out why petrol creates a rainbow effect when in contact with water, and how the behaviour of light can create all these colours, with the help of Professor Jeremy Baumberg. Jeremy - The organic molecules in petrols float on top of water since they're hydrophobic, which means they don't like to mix with water. The layer of petrol spreads out across the water but not evenly. In some places, it's only one molecule deep while in others, it's much thicker. Light reflects from both the top petrol service but also the lower boundary between petrol and water. Danielle - This means that some light rays, ones that bounce off the petrol water boundary have to travel further than the rays that reflect directly off the surface of the petrol. Making this longer journey can mean that a light wave reflected off the petrol water boundary has its peaks and trough out of alignment with the waves that reflect directly off the surface of the petrol. When this happens, the two waves can cancel each other out, leaving a dark patch. But because the light that comes from the sun is white light, it contains all the different colours of the rainbow mixed together. The distances between the peaks and troughs of the waves in red light are much bigger than in blue light. 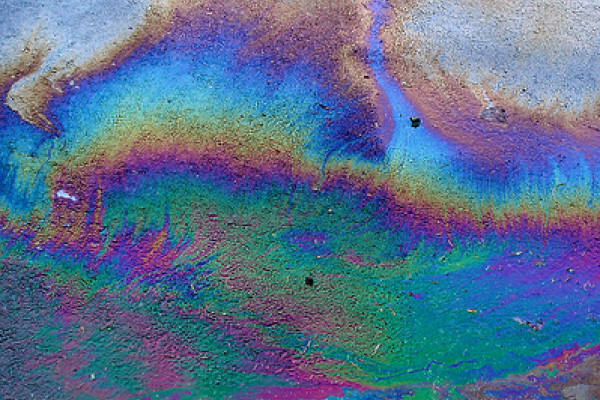 This means that while light waves of some colours will meet at the petrol surface out of alignment and cancel out. Light of other colours will arrive back at the surface in sync where they can add together and make a brighter patch corresponding to that colour. Jeremy - Different colours of light have different wavelengths. So the reflected waves from the lower boundary come back with peaks and troughs slightly shifted depending on how far they had to travel through the petrol layer. Danielle - And because the thickness of the oil varies across the surface, different places look different colours. Thank you professor Baumberg for that colourful answer. Previous Are other animals gay? Next What happens to the plastic in the ocean? Do We Need Nuclear Fusion? So, what did I find seeping out of a wet, iron and clay rich cliff? It was definitely a film, with a metallic rainbow sheen. When you touched it it split into little fragments, and it was only on the bottom metre or so of the cliff. I can't find info anywhere! The films show up as very noticeable areas of rainbow iridescence on the water, looking very much like traces of gasoline or oil. You can find lots of websites explaining how harmless “humic bacterial films” are, because agencies are constantly fielding calls from people who are understandably concerned that they are seeing rainbows on groundwater due to pollution. It’s interesting stuff, and enjoyable to look at once we realize what it is.